The Olympics are about both training the human body to its highest potential and harnessing creative engineering to gain a competitive edge. At the Winter Olympics in particular, technology plays a key role in athletes' competitiveness. As I have time, I hope to write a quick post on how aerospace engineering principles apply to athletic performance at Winter Olympic sports. Today's topic: speed skating. Full disclosure: I'm an aerodynamicist and a cyclist but I can barely skate. Speed skating is both a sprint and endurance sport, with events from 500m to 10km. Because of the extremely low friction of the skates on the ice, the primary force reducing an athlete's speed is aerodynamic drag. Reducing drag is, therefore, a paramount consideration in achieving a spot on the podium. Streamlined shapes are usually much longer than they are wide. When air or water flows over a streamlined shape (like a fish, or an airplane), it remains attached over almost the entire length. Streamlined shapes usually have very modest curvature, and they generally come to a point on the downwind / trailing side. Swimmers do a great job of streamlining, as seen by Michael Phelps in the video below. Skeleton and luge athletes do the same thing. Generally, streamlined shapes have the lowest drag. On the other hand, speed skaters stand upright in order to stay balanced and transfer power. Any shape that is much wider than it is long, or any shape that ends abruptly in a flat surface (such as a runner or a semi truck) is called a blunt body. Flow does not stay smoothly attached to a blunt body like it does on a streamlined body: it tends to separate and form a low-pressure void on the leeward side. This separation-induced pocket of low pressure causes what is known as pressure drag, and it is by far the largest source of drag for speed skaters and many other athletes. This great video by MAN Trucks illustrates the flow characteristics of streamlined and blunt shapes. At the 0:25 mark, you can see the massively separated flow behind the truck. Blue indicates low pressure. A similar phenomenon occurs behind speed skaters, as illustrated by this short-track skater from Olympic trials. I like this picture because it's a side view, and because her ponytail serves as a kind of flow visualization! The athlete is in a nice, low aero position. Her upper body is nearly parallel to the ice (and to the flow), meaning that her head and upper body will be streamlined and the flow should stay nicely attached. Her ponytail is not flapping in the wind, indicating that the flow is indeed attached in that region. Her left arm seems to be tucked in next to the body and streamlined. It's another story in the region of the lower back. Based on aerodynamic simulations of cyclists in a similar, tucked position , I expect there is flow separation because of the abrupt change in angle at the bend in the waist. The flow behind this area is going to be massively separated and result in pressure drag pretty much no matter what we do. The legs and right arm are a middle ground. Arms and legs are pretty much circular in cross section. Circular cylinders are very commonly studied blunt body shapes in aerodynamics. We expect separation behind these regions as well, but not as extensively as the area behind the waist. 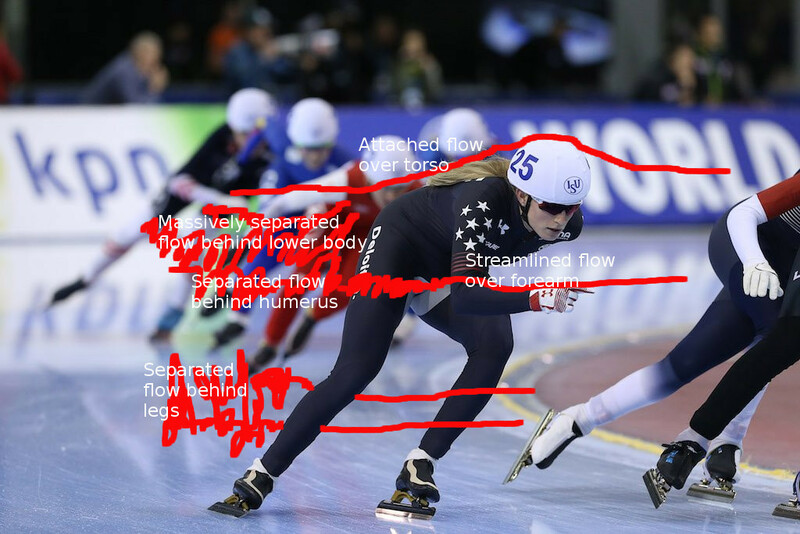 We've examined the speed skater from a pressure drag perspective. Another cause of drag is called skin friction drag: that's the force of air "sticking" to the athlete as the athlete passes through. This is not a big consideration for land-based athletes, but it could be very important for swimmers, since water is a much "thicker" substance. Draft in the low-pressure separated flow behind the competition! Under Armour claims that the dimpled texture of the fabric will reduce aerodynamic drag. But how? The answer lies in the concept of laminar to turbulent transition. At speed-skating air velocities (around 15 m/s), air naturally wants to flow very smoothly and steadily along the athlete. This is known as laminar flow. At higher speeds (such as on an airplane's wing), flow near a surface tends to fluctuate randomly (turbulent flow). 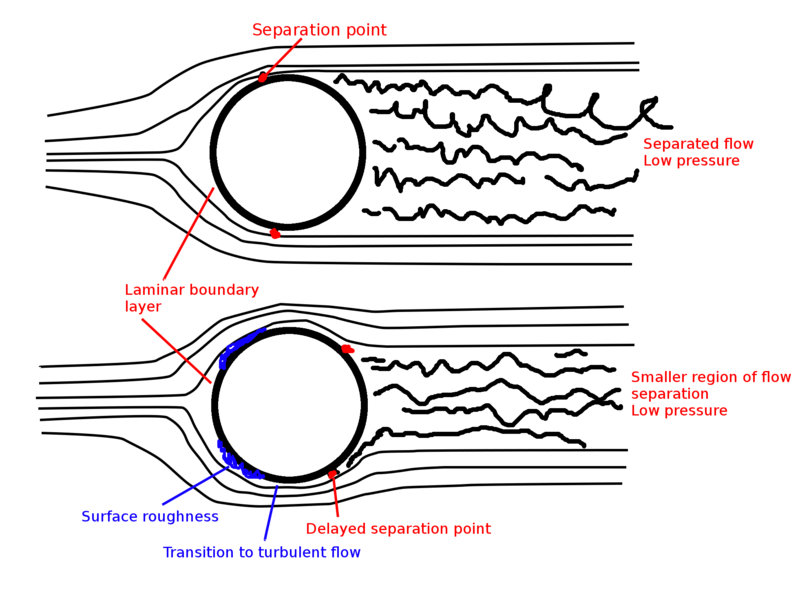 Generally, turbulent flow causes higher skin friction drag than laminar flow; therefore, aircraft designers usually try to achieve as much laminar flow as possible. It's exactly the opposite goal for speed skating. Fluid dynamics researchers discovered very early that laminar flow separates from a circular cylinder much more readily than turbulent flow. Turbulent flow resists separation. Therefore, if we can artificially induce turbulent flow around the arms and legs of the athlete, we can potentially reduce separation and pressure drag. The process is illustrated in the schematic below. But how can we engineer a premature transition to turbulent flow at speeds much lower than airplanes? Manufacturers of early, smooth golf balls discovered the answer by accident, when their customers realized that their old, beat up balls flew further than brand-new ones. Surface dimpling is actually an effective way to induce turbulent flow. The now-turbulent flow around the golf ball greatly reduced separation and pressure drag. Dimples have been a design feature of golf balls ever since. Under Armour is using the same approach to reduce drag over the arms and legs of the speed skater. They developed a special dimpled fabric, which should be at least slightly effective in reducing drag over the arms and legs. If we plug in typical speed-skating numbers, we get surface roughness on the order of 0.2mm-1mm, which visually matches what Under Armour's pictures are showing. It's more roughness than we'd expect from a regular textile. It looks like Under Armour used those strategies exactly. According to Wired Magazine, the Under Armour team spent a significant amount of time collecting experimental data in a wind tunnel. They also most likely used computational fluid dynamics to better understand the flow patters around speed skaters. CFD is a major component of my PhD research. Based on my engineering analysis, it looks like our speed skaters will have a nearly optimal aerodynamic skinsuit for the 2018 Olympics! If they want to use aerodynamics to maximum advantage, they'll need to keep an optimal aerodynamic stance, and use the low-pressure wake left by their opponents to draft and conserve energy. Until they break away for the win, of course! Feindt, E. G. 1957 Untersuchungen uber die Abhangigkeit des Umschlages Laminarturbulent von der Oberflachenrauhigkeit und der Druckverteilung. Jb. Schiffbautech. Ges. 50, 180.